This Vegan Ranch Dressing tastes so much like its dairy-based counterpart, you won’t believe it’s vegan. 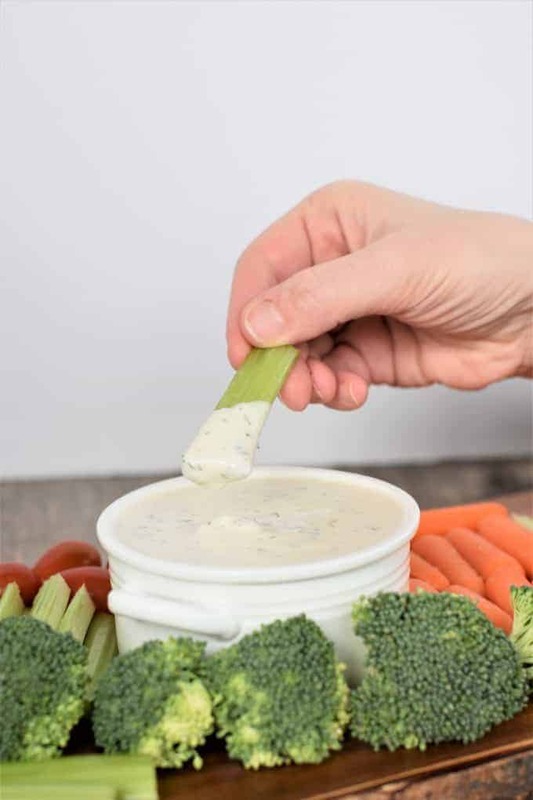 Not only is it perfect for salads, but it also makes a delicious dip for veggies, chips and more. It’s also nut-free, easy to make and requires less than 10 ingredients and just 5 minutes of prep time. It all started with my Vegan Ranch Chickpea Veggie Burgers. When I told my coworker about the burgers, she thought I said I made vegan ranch dressing, and I think she almost jumped out of her chair from excitement. Unfortunately, that wasn’t exactly what I had said, just what she wished I had said. She went on to complain that she just couldn’t find a vegan version of this American staple that met her standards. “The store-bought varieties just don’t taste the same,” she said. As a new vegan, she was on the hunt for a satisfactory replacement for her favorite dressing. So, I figured if I could make a ranch-style veggie burger, I could make a vegan ranch dressing too. Using the same seasoning blend in my burgers, I was able to create a creamy vegan dressing that made the cut. Not only did my vegan coworker absolutely fall in love with this dressing, but my non-vegan coworkers also went bananas over it. They just couldn’t believe it was vegan! When I took the dressing to work, I also brought in samples of my Buffalo Chickpea Meatballs. Not only was the dressing a hit, but so were these tasty little meatless meatballs. A win-win I must say! In addition to the Buffalo “meatballs,” this dressing makes a great topping for the vegan version of my Buffalo Chickpea Burgers too. 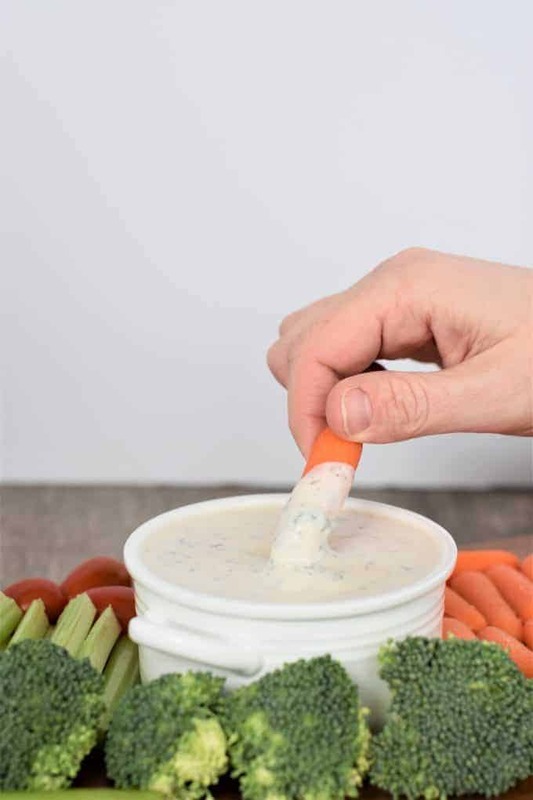 I also enjoyed dipping some chickpea nuggets (coming soon to the blog) as well as all kinds of veggies into this ranch dressing. What mayonnaise works best in vegan ranch dressing? I have made this dressing several times and have tried it with a different brand of vegan mayo each time, including Follow Your Heart Vegenaise, Earth Balance Original and Just Mayo. Personally, I prefer it made with Earth Balance, which is the brand shown in the photographs for this post. Start by adding unsweetened, plain soy milk to a pint-size mason jar. Then, add apple cider vinegar. Whisk with a fork to combine. Next, add dried parsley, garlic powder, onion powder, dill, kosher salt and white pepper. Whisk with a fork to combine all of the ingredients. Then, place the lid tightly on the jar and shake vigorously to ensure all ingredients are well-incorporated. Refrigerate for at least 2 hours. Stir before serving. Add soy milk to a pint-size mason jar. Using a fork, whisk in apple cider vinegar. Add dried parsley, garlic powder, onion powder, dill, kosher salt and white pepper followed by mayo. Whisk with a fork to combine. Seal the mason jar and shake vigorously to ensure all ingredients are well-incorporated. *If you prefer a thinner dressing, you can add 1-2 more tablespoons of soy milk. Storage Instructions: Store dressing in sealed mason jar or other airtight container for up to 5 days. If you don't have a mason jar, you can use a bowl to whisk all of the ingredients together. Ensure to whisk well since you will be skipping the shaking step. This recipe has not been tested with milk other than soy. The nutrition information shown is an estimate provided by an online nutrition calculator. Accuracy is not guaranteed. Information shown should not be considered a substitute for a professional nutritionist’s advice. Nutrition information was calculated using 1/4 cup of soy milk. This is my favorite recipe for vegan ranch dressing on the internet! I am OBSESSED!!!! So easy to make and SO GOOD! Way better than any store-bought vegan ranch dressing I have tried too! This ranch dressing looks and sounds so easy and delicious 👌 I will definitely be making this for my friend who is vegan.. I am sure she and her family will love it! 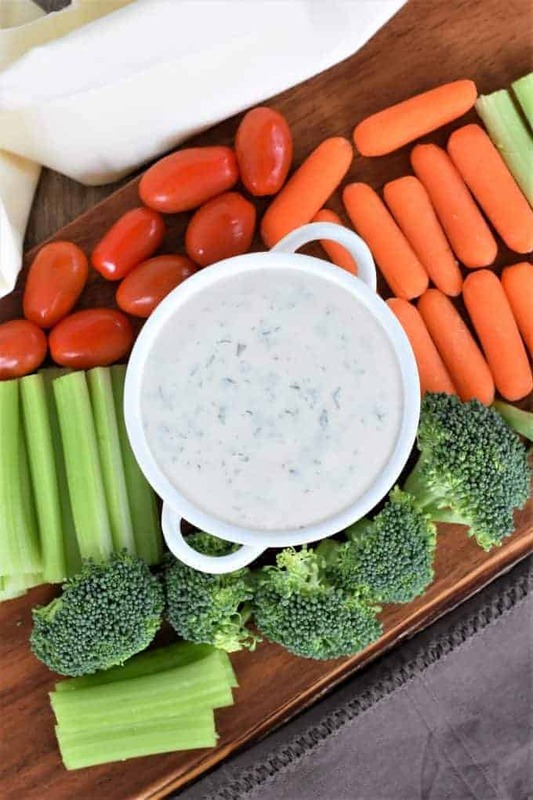 I can never resist a big pot of ranch dressing with veggies to dip in. Great that this is a vegan option too. This is definitely the best dressing I have had. I am slowly transitioning to vegan and was tired of vingerette dressing. So far I have made this 3 times and every time it is AMAZING. My mom and sister, non vegan, both love it and have made the recipe.. Thank you. This is great! Pinning this for when I need a crowd pleasing party dip! I am loving how delicious your Vegan Ranch Dressing looks, I bet my friend Trisha would love this. I will have to pass your recipe on to her.